I’ve forgotten who said that but I was reminded of it when I saw that Edgar March’s “Inshore Craft of Britain: In the Days of Sail and Oar” has just been republished. It was first published in 1970, and covers small working boats of the Nineteenth and early Twentieth Centuries. Reading it, I was fascinated that an island as small Britain should have developed so many different shaped boats to perform more or less the same thing. Each locality had grown a different tradition. These working boats were, in effect, visual versions of regional accents. Thirty five years later, I am still fascinated. 1. For the boats themselves – as complex objects, with lines and detail, some more elegant than others, but all with a functional beauty that fitted their surroundings. 2. They were true examples of the the concept of ‘form following function’, made more substantial in that they were the livelihood of their owners and crew. 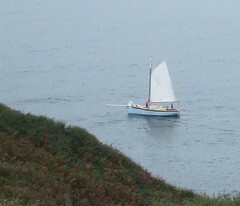 Here were small boats constructed in local yards round the coastline of a small island. They varied in shape, in design and in size, not just from region to region but often from harbour to harbour, the only limitation being in the wood and materials used in their construction. 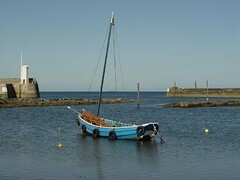 should differ so much from this Coble, photographed at Seahouses in Northumberland. After all, they were built for more or less the same purpose. In fact, the answer isn’t so difficult. Take one island, facing north, south, east and west; take tides, currents, prevailing winds; take a long, varied coastline, some stretches steep and rugged, some shallow with sand and mud, some exposed to the weather, some with large safe deep harbours, some with just a rock or two for shelter. Add a function – fishing, trade, piloting, transport. 3. The owners and crew who sailed in them. They represented the way of life of countless small communities. This was a world where experience counted, where fathers passed their skills onto their sons and, less so in those days, their daughters. Here were local communities, not necessarily isolated from one another but certainly separated, who developed their own craft specifically for the coastal conditions in their area. No different from us today – they faced the problems of the time and had to solve them. They laughed like us, they cried like us, they succeeded, they failed, they loved, they hated – just like us. They knew what hard work meant. Some did it well, some badly, a few brilliantly. Some were successful financially and went on to do more, some were less so. But their knowledge, skills and attitudes came from doing, from experiencing first-hand. It took longer to gain them, but the best results lasted as long, if not longer, than ours will today. Those hard-won abilities created individuals in a world that needed individuals. There is one major difference between are ancestors and us today. We have access to more knowledge and more skills, and at a far younger age, than those who came before us could possibly imagine in their wildest dreams – (think Google, endless courses, books, journals and DVDs). But, despite this, our basic ability to absorb and use our new-found knowledge has not grown in line with our sources. In the end, we learn best by doing too – and it still takes time. All the rest of the stuff that comes our way is ‘on approval’ – and we are becoming increasingly swamped by it, struggling to be individuals in a sea of often irrelevant information. So what’s your point, Bill? I don’t have a romantic view of the past but I do have a respect for those who learn from experience – and I don’t care whether they were born in 2007 or 1007. (At this point, it would be easy to bang on about our not learning the lessons of the past, but that’s for others to do). What I would like to do is to stay with boats and to use the concepts above – a) boats themselves, b) the fact of their form following their function, and c) the crews who sail in them, and, as I travel around the coasts not just of the UK but further afield, record, if I can, examples of craft that are being used today that represent this long line of experience. No doubt, some will exhibit a high quality of craftsmanship, some less so. But it isn’t the quality I want to pick out here. What interests me are the solutions to maritime problems that work in particular circumstances. 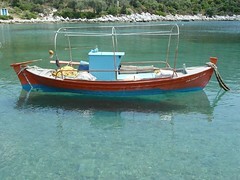 Like this small fishing boat moored in Trikeri on the Pelion Peninsular, on the Aegean shores of Greece. I do not pretend to be an expert. Inevitably, my efforts will be random observations and certainly not comprehensive. But, this is not an academic study, it is a record of small pleasures, pleasures I believe I share with many other people. It is also a record of concern, a concern I also share with many others. Times are changing so fast that much hard-won, long-term experience is being sacrificed in the name of easily-found, short-term expediency. We badly need to hang on to some of that experience. So, my entries to this blog over the next year or so will include an ‘Inshore Craft’ series of images. I hope they will be of interest to you. Please feel free to add your own if you wish. I feel more individuals require to read this, extremely great info.